Sgt. Adam Holcomb, who was found guilty of maltreatment and assault -- but acquitted on charges of negligent homicide, reckless endangerment, communicating a threat and hazing -- in the death of Pvt. Danny Chen, was sentenced to just 30 days in military jail: Jury Recommends 30-Day Sentence for Sergeant in Army Hazing Case. Army prosecutor Maj. Stephen Hernandez argued for a harsher sentence, blasting Holcomb for failing to apologize to Chen's parents directly. The sergeant wasn't required to testify, according to military law. Hernandez also reminded the jury of the rough treatment and hazing that Chen received before his suicide. "Pvt. Danny Chen was an American soldier," the prosecutor said. "He was not a Dragon Lady, an 'egg roll,' a 'chink' or a gook. He was an American soldier. "If you let it slide, these soldiers will believe it's okay." The defense apparently asked the jury for leniency for Sergeant Holcomb, citing testimony about his accomplishment as a soldier and a family man. Since we're talking about Holcomb's character, I'm guessing they didn't include any mention of the racial slurs, harassment or physical abuse he directed at Pvt. Chen. How's that for character? 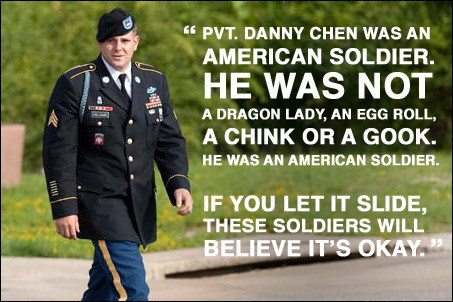 More here: Soldier gets only 30 days in Danny Chen suicide -- and will remain in Army.